You need a new calendar and we've got them! Hard to believe 2014 is right around the corner. Before Black Friday and Christmas pandemonium take over your world, get your new calendars and cross one more thing off your list. With over 57 Wolfdogs in residence we're constantly coming up with ideas to raise much needed funds. It takes big bucks to take care of so many animals. Aside from love, we are in need of a lot of supplies (see our wish list). So grab a calendar for yourself, friends, family or office Christmas present. Full moon Farm receives 50% and this sure would help buy a bucket or two. 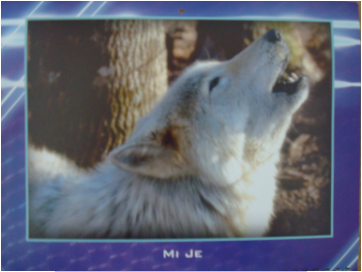 Mi'je is a high content wolfdog. She was a pet taken from her home by Animal Control due to breed-specific legislation passed in the county her owner lived in. Her owner appealed to the court to allow Mi'je to be "grandfathered" in, but the court denied the request. The owner contacted Full Moon Farm, and Nancy negotiated with Animal Control to allow Mi'je to become a resident at the Farm. She and Kaos were eventually placed with a couple, but when they divorced, they returned to FMF. Mi'je's birthday is March 21, 1999.